After Madrid’s convincing win over their rivals in the Copa del Rey fixture midweek, the clubs renewed hostilities in the league albeit with little at stake due to Barcelona’s 16 point lead. Both sides minds were firmly fixed on forthcoming Champions League games. And it appeared to be a serous case of Deja Vu. It was as if the midweek clash in the Copa del Rey had never occurred. Barcelona changed a couple of players yet set about their task with the exact same game plan which played perfectly into the hands of a mainly fringe Real Madrid side. As expected, both sides made a number of changes to their respective starting line ups for this game but the extent to which Mouirnho made changes surprised many observers. Essien moved in at right back with Pepe in a defensive midfield role. Roura brought Mascherano and Thiago into the side for the injured duo of Puyol and Xavi. Villa started with Cesc on the bench. For Madrid, this game, as important as a clasico is, was entirely secondary to Tuesday night in Manchester. Whilst Barcelona needed a performance more than anything in this game following recent disappointments. Once more in a clasico, Barcelona dominate possession but Real Madrid possess a much greater attacking threat. The possession stats look anomalous. Barcelona made 631 passes from 701 attempted as they gained 63% possession they they scarcely looked like scoring aside from their one goal. Madrid meanwhile, only made 186 successful passes but carried a real attacking threat borne out by their 14 attempts at goal. Strangely, all of their attempts came from the left to centre positions. No shots originated from the right. David Villa started but is becoming increasingly marginalised and wasted in a wide left position. This may offer Barcelona tactical width but Madrid were unconcerned by him and retained their defensive shape. The lack of a central reference point, somebody who can make runs and occupy and stretch opposing central defenders is a major obstacle now. Barcelona managed five attempts in 90 minutes yet Ronaldo could muster six attempts in a brief 32 minute cameo. Quite simply, Barcelona appear to be content with possession for possession’s sake but there must be an end product. There is no point in passing the ball. The 30th minute summed up Barcelona’s approach. Messi and Iniesta exchanged a series of passes about 10 yards inside the Madrid half under no pressure. 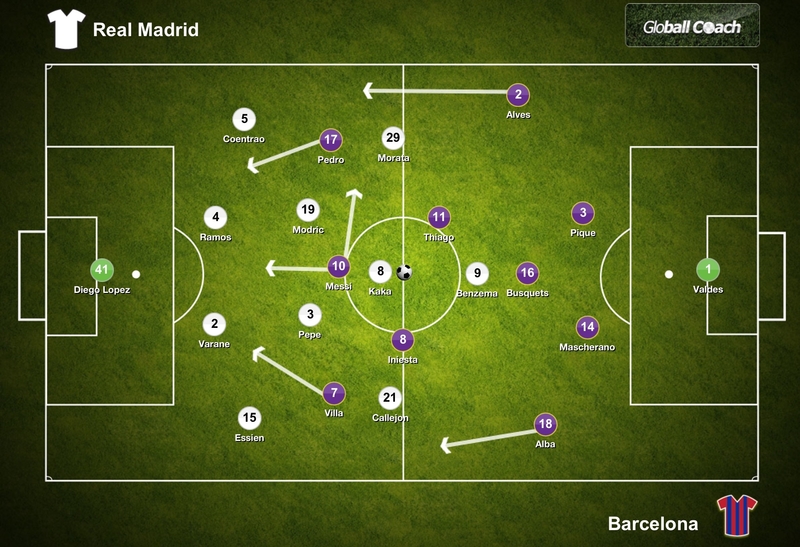 Why should Madrid charge in and press their opponent thus opening up space? 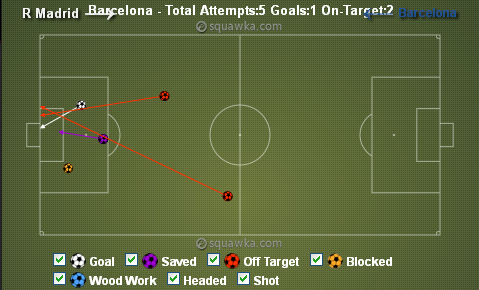 Apart from Messi’s goal, the only other shot on target from Barcelona arrived due to an error by Madrid. There are two issues for Barcelona to address. 1. If Barcelona are intent on continuing such an approach then they must tempt the opponent out by building play deeper. They force the opponent deep and contribute to their own downfall. Construct play deeper and allow the opponent to move forward. It carries risks but also rewards. 2. Barcelona must develop a greater sense of dynamism and verticality to their game. Too often the movement is lateral. They need to adopt a little of what makes Real Madrid so good; the explosive pace and movement on counter attacks. Barcelona will not counter like Madrid with the players they presently possess but they can increase the tempo and counter. Forgo the control for that riskier pass every now and then. Take the chance. Real Madrid set up with a broadly similar set up to that which worked against Barcelona midweek. The main difference this time being that whereas Ronaldo and Higuain were less inclined to track back, Morata and Benzema recovered position quickly and dropped deep. The performance of Callejon was one of complete discipline and intelligence. The forward sacrificed himself for the team, undertaking his defensive tasks with diligence and completely nullifying Alba in the process. Callejon made two successful tackles in the game, both occurring deep within his own half. There was something almost Saachian about this Real Madrid performance today. So often the side was very compact with the whole team being within about 25 meters from defence to attack. Lines were compact and the team defended as one unit before bursting forward when they became more open. To retain discipline and organisation for the full 90 minutes requires a superb collective effort from all the players. And yet again, a Madrid side prevented Barcelona from creating many genuine opportunities. This was not a park the bus performance, it was a Rolls Royce performance. Madrid opened the scoring after just five minutes. Ramos intercepted a Thiago pass near the halfway line and released Morata who making his clasico debut. The young forward beat Alves far too easily on the left and whipped in a cross to the far post where Benzema had run off Mascherano and knocked the ball home. Alba was five or six yards further back when he should have been much closer to his central defender. It is a goal so typical of Madrid. Gain possession and swiftly attack before the opponent can regain shape. It’s the exact sort of goal that Barcelona seldom score. Too often recently Barcelona have lacked penetration with no player making runs in behind an opponent to stretch their defence. David Villa provided this to an extent against Sevilla even though he spent considerable time on the left. The equalising goal arrived when Messi made a surging run forward and latched onto Alves through ball. Cutting to the inside of Ramos, Messi beat Lopez at his near post far too easily. The keeper really should have saved the effort. Messi becomes the first player to score in 16 consecutive Liga games and also equalled Di Stefano’s record of 18 goals in the clasico. It was the one bright spot for Barcelona. Sergio Ramos scored the winning goal. For the third clasico in a row, Barcelona concede a goal via a header. The ease with which Ramos beat Pique in the air was considerable,demonstrating a gap in the physique and power between the sides. With two wins in a row under their belts, Madrid can head to Manchester in fine fettle for the real game that matters to them against Man Utd in the Champions League. Having said that, it will be a strong boost that a team containing to many squad players, albeit hugely talented squad players, can see off Barcelona without any real examination. For Barcelona, a period of greater introspection is needed. The illness of Vilanova had pushed Jordi Roura into the limelight. Clearly uncomfortable with the role and now clearly struggling in the role, the primary concern Barcelona face is overcoming Milan in the Champions League. To do so though, requires recognition of the issues facing the side and an ability to make key alterations mid-game. Thus far, Roura has not demonstrated either skill. At this precise moment, decisions that Barcelona take off the park could prove to be as important as decisions they make on it. For such a meaningless game, as if any clasico could ever be completely meaningless, there are significant ramifications for each partner. Despite being a game with lower than normal intensity, a win is still important. The 16 point gap between the sides being narrowed to just 13 points will have no bearing on the title but this game, and midweek, is further confirmation, if it were needed, that there is no inferiority complex from this Madrid side when the face Barcelona. It is now Barcelona who are left to wonder how they will defeat their rivals from the capital.